Our Foolish contributors think that this energy company, this biotech ETF, and this tech giant are all great equities to hold onto for the long haul. Here's why. Holding stocks for long periods of time is the only proven method of producing life-changing gains on a consistent basis. 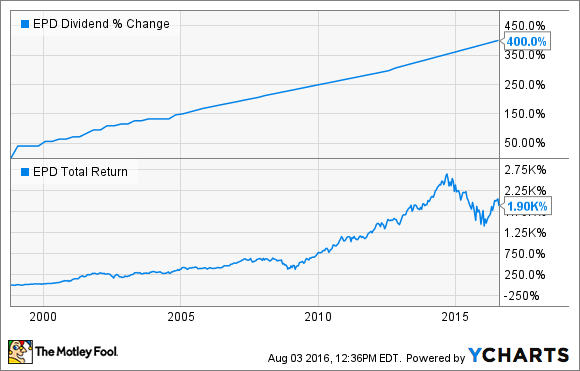 For one reason or another, though, not all stocks are great long-term buy-and-holds. So, to help investors wade through the sea of possible candidates, our Foolish contributors discuss three investing vehicles (2 stocks and 1 ETF) below that they think stand apart from the crowd in terms of their ability to create value for shareholders over the long-haul. Tyler Crowe: I don't know if I can say that I would never sell any stock in my portfolio. Times change, and even the most sound company can be different 10-20 years from now. That being said, one company that would require lots of things to change before I would even consider selling my stock is natural gas infrastructure and logistics company Enterprise Products Partners (NYSE:EPD). One thing that gives Enterprise a huge competitive advantage is the size and scope of its infrastructure network. It is the nation's largest natural gas liquids transportation network, with connections to processing plants, petrochemical factories, and export terminals that give the company several options to gather, process, and sell products in the most efficient manner possible. What also helps is that the company is mostly insulated from the ups and downs of commodity prices because it contracts its services to customers on a fee-based structure that ensures a steady flow of cash going into the company's coffers. The other thing that sets the company apart is its management. Enterprise's management has been very adept at allocating capital to high-return projects that add cash flow to the financial statements and extend the capacity of its system. This approach has allowed the company to raise its payout to shareholders every year since it had its IPO in 1998. Unless we see a rapid change in the way we use fossil fuels in the next couple decades, I can't think of any reason why I would want to sell this solid dividend paying stock. George Budwell: The stock that I'd never is, well, an ETF: the iShares Nasdaq Biotechnology ETF (NASDAQ:IBB). The IBB is a quick and easy way to gain exposure to an industry that has several major tailwinds going for it with no end in sight. Its sustainable advantages include the aging populations of most Western nations, unprecedented levels of innovation, greater access to health insurance for low-income individuals in the U.S. via Obamacare, and, unfortunately, ever-rising levels of disease rates, all factors that can be expected to drive biotech to new heights in the coming decades. The biggest challenge with biotech, though, has always been picking the right stocks to take advantage of these substantial tailwinds. Clinical-stage biotechs, after all, can implode in an instant on a negative data readout or regulatory setback, and even large cap companies can take a hit from unexpected moves by pharmacy benefit managers or the U.S. government. By holding positions in 187 U.S. biopharmaceutical and biotech companies at last count, the IBB allows investors to avoid these pitfalls through the simple power of diversification. So as long as biotech keeps sailing along on these powerful tailwinds, I'm perfectly content to hold the IBB as my primary investing vehicle for this particularly volatile industry. Andres Cardenal: Alphabet (NASDAQ:GOOG) (NASDAQ:GOOGL) is one of the biggest positions in my portfolio, and it's also one of my favorite stocks for the long term. The Google division provides the lion's share of sales and earnings. The company is the global king of online advertising, and it generates huge profit margins, in the area of 33% of revenue at the operating level. The "other bets" division is operating in the red, but it offers massive room for growth in areas such as self-driving cars, high-speed internet, healthcare innovation, and outer space exploration, among many others. Financial performance doesn't leave much to be desired. Alphabet reported $21.5 billion in sales during the second quarter, a 21% increase in U.S. dollars and a 25% year-over-year jump in constant currency terms. The business retained 28% of revenue as operating profit during the period. When making investment decisions, we usually have to make tough choices. Companies making consistent and reliable cash flows tend to be stable and mature, and they generally offer below-average potential for growth. On the other hand, dynamic growth companies are generally riskier and more unpredictable. Alphabet is a notable exception to the rule, as the company provides both indisputable quality in its Google segment and tremendous potential for growth in other bets. For this reason, I believe Alphabet is a world-class business to hold for the long term, perhaps even forever.